Regarding some of the “tweaking” suggestions, I believe I like your solution. Improving scansion (the flow and meter of lines, for those learning these terms) is one thing but altering ones genuine sound is another. I personally like what you describe as your “Swinglish,” because it sets you apart from other poets. As you know, I am hardly satisfied with any result I achieve myself. I tend to engage in acts of “lucasing” over time, until I am happy with the result. So even after posting, you will often notice, I’m sure, that I tend to change a word or two. Your subject matter brings to mind that the US has always been much different, I think, than this. Our brand of patriotism, even when rather extreme, has almost exclusively been regarding a love of freedom, and a fear of its disappearance. This is what I’ve felt, myself, and this is what my sweetheart has felt also since coming here permanently. Our current administration causes us, for some reason, to differ from this in some ways. This, by the way, is not a political observation. One can debate a left or a right-leaning policy, and, whatever our position, and regardless of whether, in the long run, such policies turn out to be ill advised, such things can be weathered, as the country has weathered, I think, far worse things prior to the last handful of administrations here. Strangely, what concerns me is not at all political. It is the pictures. There are images of our current president everywhere. Large, small, and in-between. Very unusual for this country. Very reminiscent of dictatorships we have seen around the world. Like the man, or not; agree with his ideas or not; this is what concerns me. And it concerns those of my friends who come from other countries. And I should say they do vary greatly in politics. One friend describes it as a personality cult; and whereas I would perhaps not go that far, still this is most unusual. This did happen once before in the country to some degree, Some of us loved FDR, some didn’t, but most of us, were spooked by the personality phenomenon. The more we thought about it, the more spooked we were; which is why we were able to easily pass a term limit amendment for the President here. Two four-year terms, but not more than 10 years, in the case of a succession. President Ford, for example had two and a half years into his succession, had he won his first presidential election, which he did not, he would not have been able to run again. I am playing around with different verse format. This time a Villanelle, I choose to write it in tetrameter. It is based on a prompt on twitter called liblit. and it was “a doll, and bonus word is Jingoism – “extreme patriotism”. Personally I find that very dangerous and there is usually a master behind that stand to gain from “patriotism”. 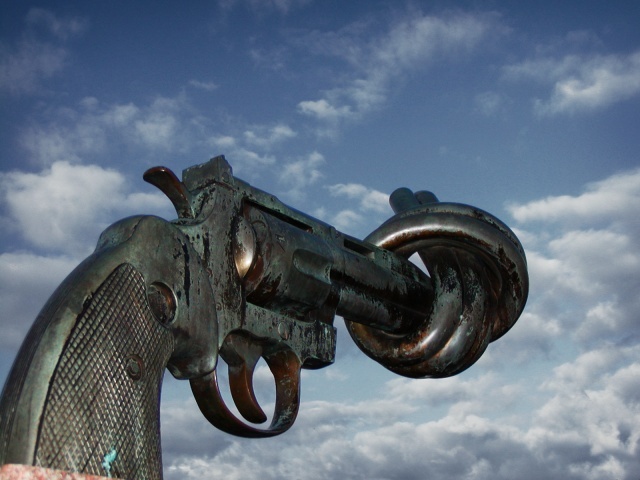 Picture is Carl Fredrik Reuterswärd’s famous sculpture on non-violence. Many copies exist, but this one is from Malmö Sweden. Picture is taken from Wikimedia commons.